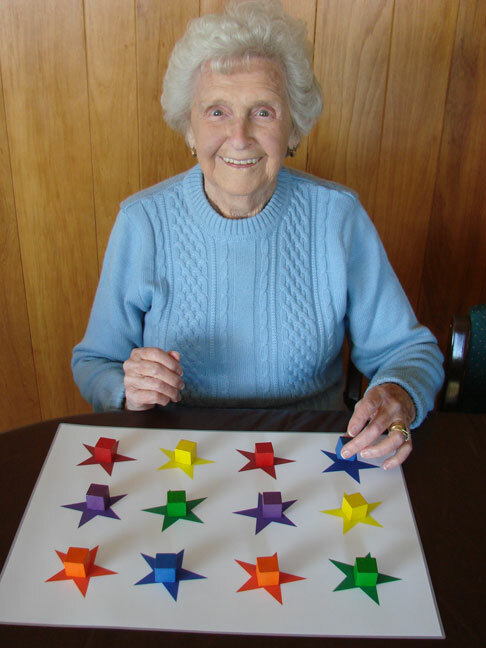 Arlington Court is bringing Montessori-based activities to our memory care unit! The Montessori Method of education and learning was developed in 1939 by Maria Montessori. She was an early childhood educator who believed that people would learn better and more independently if given the right materials and environment to explore on their own. Since its inception, the method has been successfully adapted to address the needs of patients with Alzheimer’s disease and other dementias. Our memory care unit has a desk with papers to file, adding machines and other office equipment. There are simple household tasks and a folding table, a piano and a vanity is stocked with jewelry, hats and cosmetics. These stations are available at any time. Giving older adults the appropriate and safe environment to explore and discover on their own has been proven to soothe and de-escalate behaviors. It also fosters a sense of purpose and engagement in the world around them. Montessori activity programming works best when conducted in conjunction with more organized, traditional group activities. Montessori stations are set-up and made available to patients to explore in idle times of agitation or anxiety. Vrable Healthcare would provide several options for the idle dementia patient such as a working desk complete with type-writer (familiar to patients from previous generations), a vanity with accessories and jewelry to explore, a folding table with household items such as laundry, mutli-colored silverware for sorting and cleaning and other household items and a work bench with simple tools, sanding paper and sorting blocks. These stations would be available at all times and utilized by patients between group activities. They can be used as a behavior intervention for residents experiencing aggressive or other behaviors with simple cuing from nursing or activity staff. The STNA and or nurse can intervene gently, “Ethel, you seem upset. Why don’t we get to work and organize your workspace?” Sometimes the act of filing papers at the resident’s level can be a soothing activity as well. This interrupts the situation between residents and gives Ethel a sense of accomplishment. The other patient in the scenario can be taken to another area and given a job as well (matching and sorting socks, for example). Not only does this diffuse a potential behavior, it also boosts self-esteem in the patient. Self-directed tasks can give our residents a sense of autonomy when much of their executive function has been compromised. The Montessori Method offers space and materials to explore and enjoy. Our Montessori stations offer a wide array of activities available between more structured group activities and promote a sense of accomplishment and well-being in our residents.